The competition was exciting, but besides being faster or stronger than another person, in the heart of nearly every athlete there is a far more important competition—one that cannot easily be seen, except perhaps in the eyes of a hungry athlete, even in the ones that didn’t come close to winning a medal. Sure, the athletes’ competitions were with the other competitors. It IS sports after all, but the most important competition, the one that provides the drive and power to compete effectively against others is the competition inside each athlete. There were instances where that inner competition was easy to see. Take Daelan Kristofer Hilado Alviz, 17 year old high jumper from Guam as an example. Even after he had clearly beaten the two closest competitors, he continued to strive for his personal best, jump after jump, and soon the eyes of the crowd were watching that inner competition unfold on the field at the PICS track and they cheered when he was successful. After he had cleared the bar set at 6 feet to cheers from the smaller crowd on that last rainy day the bar was reset to 6’1”. Daelan, who is only 5’10” says that his unofficial personal best high jump is 6’1”. His official personal best is 6’0”. He wanted to make 6’1” an official personal best. Three times he tried and three times the bar clattered to the ground. He didn’t make it official on that Saturday but I know that if he had he would have raised the bar even higher and tried for a new personal best. It’s a stunning thing to watch, really, and it’s easy to get caught up in the drama of it. It’s why so many people are sports fans. We can’t know all of the athletes’ personal stories or their journeys to where they were during the competitions. I know that now having done all of the work to do medals analysis only to wonder what the cold numbers actually say. They do say something and I’ll talk about that, but there are stories behind every athlete that once known, make their performances all the more exciting. Take the Chuuk team for example. They put up some decent win numbers especially when you consider the fact that they train in what most would call deplorable conditions without a real track to speak of. Yet they always struggle hard and the effort they put out always shows. Yap didn’t score any medals but I would venture to guess that there were some personal bests for their small team as well. I noticed for the first time during this competition something that has probably been pointed out many times before but that I had never heard anyone talk about. The person who stands on the highest tier of the medals stand, the gold medal winner, must bow lowest to receive their prize. There are all sorts of things to be said about the symbolism of that. Perhaps it is the mutual inner personal competition that made for such camaraderie both on the track and off it, but it was obvious to even a casual observer during the games. A team by team listing of medals won isn’t really all that informative because all the teams had widely disparate numbers of athletes. Pohnpei kept 86 medals at home. 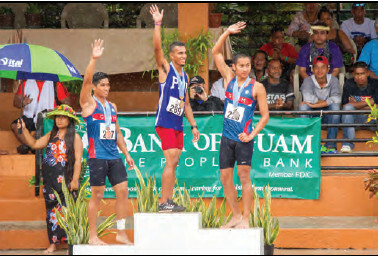 Guam took 42 medals back with them, but the Pohnpei team had 40 athletes while Guam only had 18. The Northern Marianas Islands athletes took home 16 medals as did Nauru. Nauru had 11 athletes while NMI had 12. Palau’s eight athletes took home 12 medals. Chuuk’s 15 athletes flew home with seven medals. Marshall Islands’ nine athletes took home five gold medals. Guam took home more medals than other teams on a per athlete basis at 2.33 medals. At 26 gold medals, their percentage of gold medals to the total number of medals earned was also higher than any other team. Guam had 26 gold medals, nine silver medals and seven bronze medals. 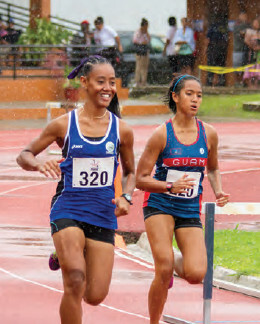 Pohnpei took home 86 medals for the second highest “per athlete” medal score of 2.15. Of those 27 were gold, 39 were silver and 20 were bronze. Palau’s 11 medals meant that the team earned 1.5 medals per athlete. Six of those were gold. Four were silver, and two were bronze. Nauru brought home 1.45 medals per athlete. Three of those were gold. Four were silver, and nine were bronze. NMI’s athletes earned 1.33 medals per athlete. Eight were gold. Five were silver, and three were bronze. Marshall Islands brought home one gold, three silvers and one bronze medal for .56 medals per athlete. Chuuk brought home a respectable .47 medals per athlete. Four of those were silver and three were bronze. For the most part the event was extremely well organized. It seemed that all of the volunteers knew exactly where they needed to be and what they needed to be doing once they got there. The medical team was outstanding and dealt with a few injuries during the championships. The live results that were being provided on the Oceania website during the championships was the best method of handling it that we’ve seen at any sporting event here. The technological support and attention to sporting standards were outstanding. As good as the organization was for the games themselves, there were a few tense moments for members of the media who had not been invited to meetings they didn’t know were happening. Otherwise, the organization of the games was magnificent and it showed right down to the police support on the streets. 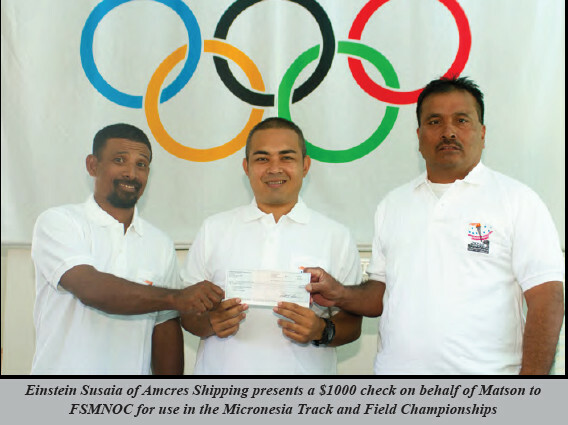 Well done Micronesia athletes and organizers. Well done indeed.